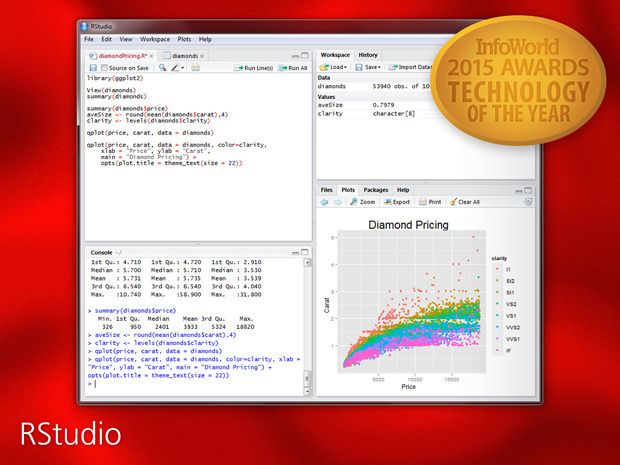 RStudio - Infoworld 2015 Technology of the Year Award Recipient! Sometimes the universe surprises us. In this case, it was in a good way and we genuinely appreciated it. Earlier this week we learned that the Infoworld Testing Center staff selected RStudio as one of 32 recipients of the 2015 Technology of the Year Award. We thought it was cool because it was completely unsolicited, we’re in very good company (some of our favorite technologies like Docker, Github, node.js…even my Dell XPS 15 Touch!…were also award winners) and the description of our products was surprisingly elegant - simple and accurate. We know Infoworld wouldn’t have known about us if our customers hadn’t brought us to their attention.